How odd, I've tried searching for simple posts I know exist, can confirm. 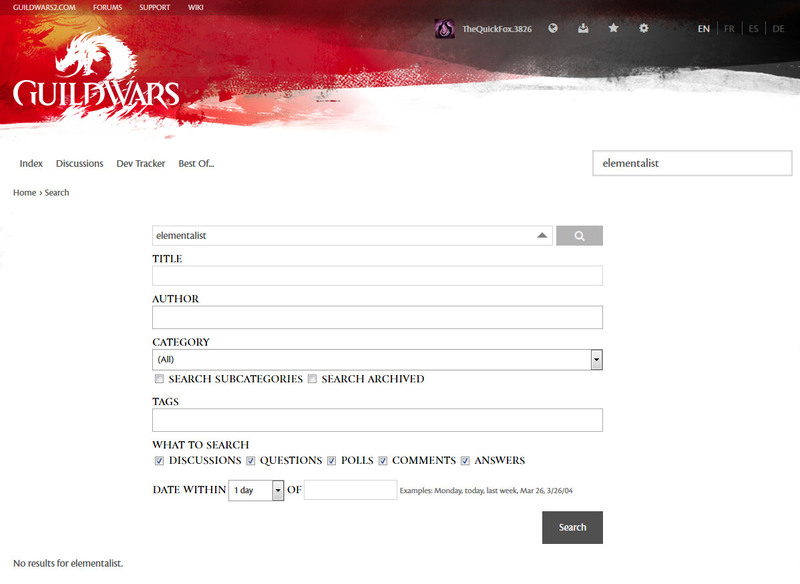 In the interim, if anyone needs to find something, google for site:en-forum.guildwars2.com whatever you want should be a possible work-around. I'm sure the forum team will fix the bug soon, but until they do, enjoy the flashback to the old forum search. Just to note, the forum search appears to be functional again. I am just writing up a full bug report for the forums. I found that just now, "Search" seemed to work just fine for me, as well. If anyone were able to jump in and do a little ad hoc testing for us, that would be great! If you do that, please post here if Forum Search is functioning ok for you now. This will allow me to send a fully-accurate and detailed report, so I do appreciate the help very much. @Gaile Gray.6029 Search has been up and down like a roller coaster the last few days I've tried it. Edit: Even searching for something basic like "Elementalist" yields 0 results. Search is non-functional now. Browsing using Waterfox 56.2.0 (most recent), allowing scripting and cookies for both guildwars2.com as for arena.net. Just used search for Elementalist and got tons of results. Ditto for diminishing. No issues what so ever. Search is not broken. It works fine now indeed. Must have been fixed in the meantime then. Yes, it works fine now... but give it 10 or 12 hours from now. This has been what it's been doing over the last few days. As I said, it's like a roller coaster (up and down), i.e. - working during some hours of the day and, obviously, NOT WORKING at other times. I tried to search for a few things this morning and it didn't work at all. Worked for me on my phone in desktop mode. Managed to find a thread created after this one along with this thread too.